Image caption The Byres Road branch of Fopp was popular with many artists from Scotland’s music scene. It was the mothership of an independent record shop empire that grew from a one-man Glasgow market stall to 100 stores across the UK. Fopp on Byres Road helped shape the musical tastes of thousands of Scots and influenced some of the country’s most popular musicians. 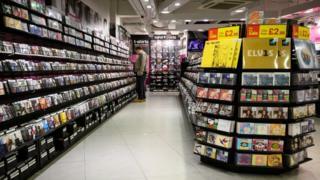 But its doors have been closed for good after the chain’s owner, HMV, was bought by Canadian firm Sunrise Records. The deal has also led to the closure of HMV branches in Ayr and Braehead – but it is the loss of the Byres Road branch which has been most keenly felt. Members of bands like Mogwai, Belle and Sebastian and Arab Strap have all described how the Byres Road shop – situated in the heart of Glasgow’s student area – was a key part of their musical education in the late 1990s and early 2000s. 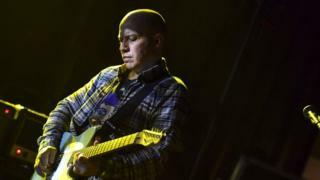 Mogwai guitarist Stuart Braithwaite was one of the first to pay tribute to the store’s importance after the news emerged, describing it as “a great place to buy music for as long as I remember”. 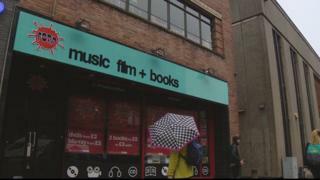 Many other musicians and music fans shared their dismay after closure was confirmed on Tuesday. It is an outpouring of love for the branch which the Fopp’s founder, Gordon Montgomery, grudgingly accepts. The 61-year-old is hazy on when the branch opened – “late 1980s or early 1990s” – but he is clear on the impact it made. He said: “Byres Road was one of the early ones and was probably the one most synonymous with Fopp’s success. “I had established a shop in Edinburgh at the time but it wasn’t making as much money as the Byres Road store. He added: “There was a point when Fopp was a very credible alternative to the big chains, and ahead of the rest of the independents. 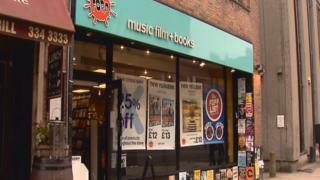 But Montgomery said he was not surprised the Byres Road branch has shut. “I don’t think the numbers work any more,” he said. Fopp began its life in 1981 as a stall in De Courcy’s Arcade, a short walk from the Byres Road branch. Montgomery had started the stall using a £3,000 redundancy cheque he received from Virgin after setting up the company’s first Megastore in Scotland. The record store landscape at that time was very different – including giants such as Virgin, Our Price and Tower, along with a string of rival independent stores. Fopp was always known for its range of heavily discounted vinyl and CDs, and that appeal endured as buying habits changed and books and DVDs became a bigger part of the business. The firm went on an aggressive expansion programme, but disaster struck in 2007. The company went into administration, ending Montgomery’s involvement in the firm. Like much of the industry, Fopp was hit by the rise of supermarkets and online retailers selling CDs and DVDs, as well as the surging popularity of downloading and then streaming music. Later that year HMV bought the Fopp brand and reopened six of the stores. However, HMV itself went into administration in 2012 before being bought by restructuring specialist Hilco, which took over the company and its 141 stores. The HMV chain called in administrators for a second time in December 2018, before Sunrise Records beat competitors such as Sports Direct owner Mike Ashley to buy the business. That deal has seen the number of Fopp stores reduced from nine to five, with a total of 27 HMV and Fopp branches closing across the UK. Montgomery, who now lives in Bristol where he runs a record shop, remains sceptical about HMV’s future. He said: “For a start I am quite surprised at how many stores they kept open. “They will have to do something quite different to just dusting down the old back catalogue.